After careful consideration, I chose not to raise our country’s debt limit and voted against increasing the debt ceiling. I don’t believe it is fair to our hardworking taxpayers to give the President a blank check to spend as he sees fit. H.R. 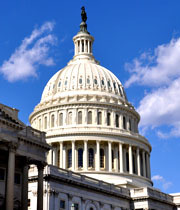 325 will raise the debt ceiling until May 19, 2013, without setting any caps on how much the Administration can borrow. Although I opposed giving the President four months to spend unlimited taxpayer dollars without requiring significant spending cuts, I was supportive of other aspects of the legislation. It has been four years since the Senate passed a budget. With no real budget, is it any wonder that our country has a deficit problem? So I agree that Congress shouldn’t get paid if they fail to do their job and pass a budget. But with our country buried under $16.4 trillion in debt already, the idea of increasing our debt limit to pay for more wasteful Washington spending was simply unacceptable. I have advocated common-sense solutions to Washington’s spending problem, like closing loopholes in welfare programs and reducing inefficient government bureaucracy. Americans are tired of empty promises from Washington to address our spending problem. They deserve better. I refuse to kick the can down the road any further. We must get serious about fixing our debt now. I look forward to working with House leadership in the coming months to find real solutions for Americans that reduce government spending and balance the budget.